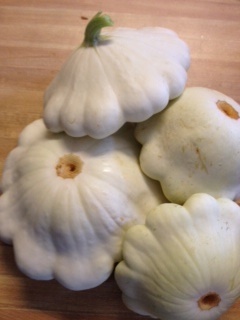 Farmer Kim, aka Kim Hartline, came by with my eggs, along with a surprise “challenge” package for me – patty pan squash. 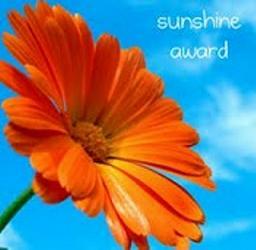 He had picked some and when his wife asked what you do with it, he said, “I don’t know, I’ll give it to Andrea and see what she will do with it.” Of course he added a twist when he handed them to me – it needs to look like patty pan, I couldn’t just chop it up and use it like zucchini. So, after I laughed for awhile, I thought, “How cool is this? 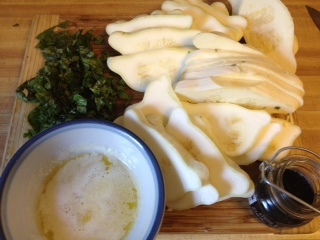 I am getting my own food challenges!” I have never cooked patty pan squash before, so this took some thought. 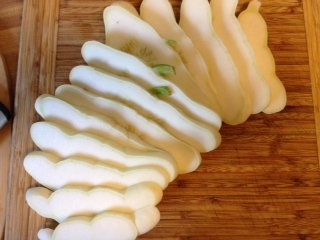 Sliced – it needed to be dishes where I would slice the squash to show its shape. 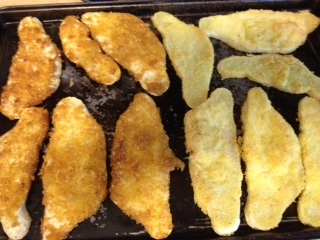 I decided on 2 cooking techniques – pan frying and baking. 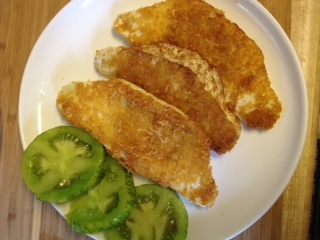 For the pan frying, I initially thought about coating it in a spicy cornmeal coating, but when I went to my pantry I also found cornflake crumbs. Hmm, that could be interesting too. 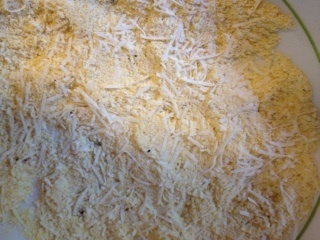 So I would have a cook off within my challenge – cornmeal v. cornflake crumbs. Once I was cooking, it even felt like a South v. North thing. 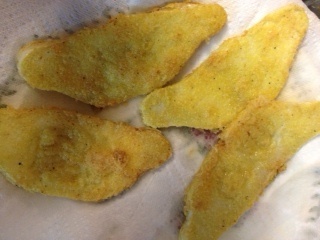 The cornmeal coating is similar to what I use on okra, so it felt very southern to me. 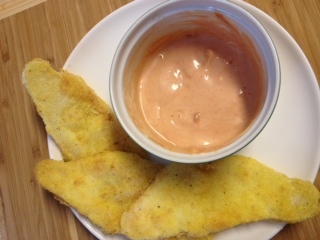 It would need a dipping sauce, so staying with the southern feel, I mixed equal parts mayo and ketchup – a surprisingly tasty condiment. The cornflake crumb coating felt very much like something my mother would have cooked when I was growing up in New York – quite northern. Initially, the cornmeal with the sauce was winning out with the tasters. But then, I thought to combine the cornflake crumb squash with a slice of green zebra tomato – oh was that good! So, they both ended up with thumbs up. Place the beaten egg in a shallow bowl. Combine the ingredients for either of the coating options and place in a shallow bowl. Pour the oil into a large non-stick frying pan to 1/2 inch deep. Heat over medium-high heat. 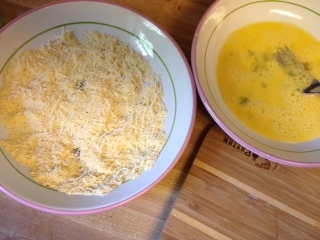 Dip the slices in in the egg and then into the coating. Place it the hot oil and cook until lightly browned on one side. 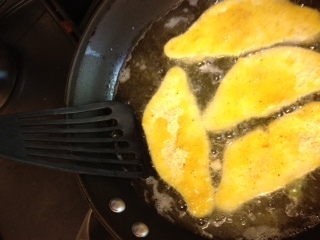 Flip (I use a fish spatula so the oil will drip through) and cook until golden brown on the other side. Remove, allowing the oil to drip through the spatula back into the pan. Drain on paper towels. The slices can be kept warm in the oven until ready to be eaten. 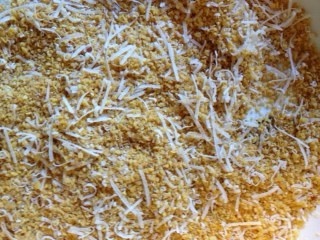 Cornflake crumb is on the left, cornmeal on the right. The baking technique I chose was from a recipe I found on the web – baked with butter and basil from foodrenegade.com. 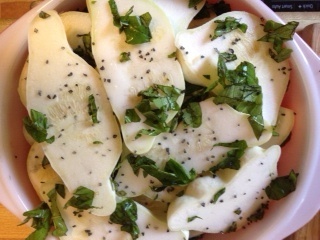 It was very simple, just squash, chopped fresh basil, melted butter and sea salt. I did not change her recipe, so simply click here to try this recipe. I used 3 smaller squash in this dish. The slices from 2 of them tasted wonderful. The third must have been an oder squash, because it was bitter, which took away from how good the rest of it was. Would I try this one again…maybe. Love it. What will the next food challange be? I will have to come up with something that you cann’t buy in the store. Hummm what will it be? Late season fruit? I will give this some thought. C Ya. Kim. 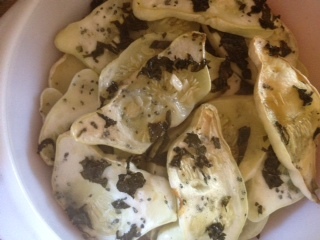 great uses of pattypan squash. I didn’t grow any this year, but it’s delicious! It is awesome to slice it like you did, drizzle with olive oil, and grill. Amazing flavor and texture!! I will have to try that next time!